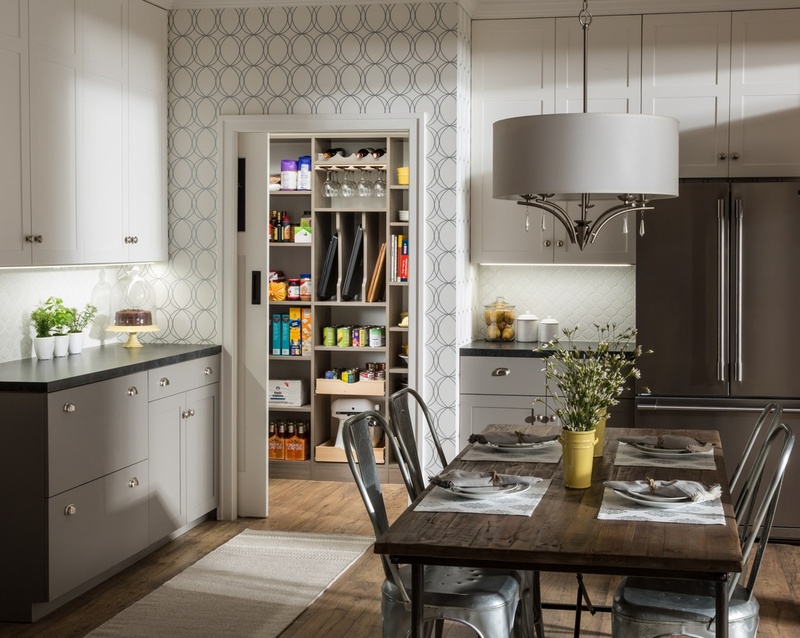 Pamper the cook in your kitchen with a beautiful walk-in pantry. Shown here in Driftwood, it blends gracefully into your home, multiplying your storage space to keep countertops clear and make way for prepping food and entertaining. Tall shelving towers and deep corner shelves can be stocked with your favorite groceries, small appliances, and cookbooks. A built-in wine rack and stemware holder stores bottles above and glasses below, keeping them safe and convenient to reach. Tray dividers store cookie sheets, cutting boards, and platters on their sides to maximize storage space, and slide-out wire baskets keep produce visible and easily accessible.